Things have been a little quiet at “The Pear Tree” recently. But we have been making lists of things we want to cook and things we have been practicing and will be posting shortly. Another thing is that I keep forgetting my camera when we are at restaurants or markets or places where we have had amazing food. I am working on this, so hopefully more posts in the coming days. 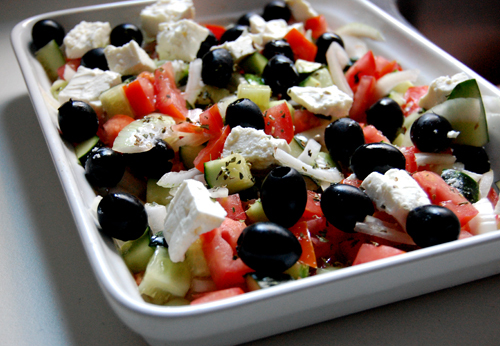 Here is a traditional Greek salad, without lettuce. It was made for the night of the Eurovision song contest, for which we made food from a lot of countries. Bangers and Mash – UK, Goats cheese – France, Chorizo and Salchichon – Spain Smoked fish- Scandinavia and a shredded beetroot salad to represent the Ukraine, Moldova and other other eastern European countries. I love beetroot.The Greek Salad was dressed with fresh Olive oil from our friend Gabri’s mother. It is truly delicious. Chop the ingredients and mix together. drizzle with olive oil to finish and season with a little salt.